Language differences are an entertainment. Earlier in the trip, I had flummoxed the ladies in an optician shop when I told them I wanted to buy a pair of cheaters. We speak the same language but not the same slang. As George Bernard Shaw observed, “England and America are two countries separated by a common language.” Quite right. In the United Kingdom, one may enjoy faggots for breakfast, bangers and mash at the pub, and bubble and squeak for several days after the Sunday roast. Mums and dads cover skinned knees with pasties. Drivers operate their hooters and winkers to get the attention of lorries and motorcars. On a rainy day, one is wise to wear a mackintosh and a pair of wellies. Of all these expressions, the mindful warning on the subway is my favorite. I make no apologies for being a people-watcher, a chronic eavesdropper and a lover of the expansiveness of language: the way it is fluid and figurative. Consider the contrasting styles of American and English warnings. When Americans want people to use caution, we say “Watch out!” Conversely, “Mind the gap,” asks the passenger to use several senses: to see, hear, and feel the pavement underfoot. I especially appreciate “Mind the Gap,” because it suggests a deeper meaning, reminding me of a couple of other phrases that, coincidentally, relate to transportation. Printed on my car side mirror is the sentence,“Objects in the mirror are closer than they appear.” Flight attendants announce,“The best exit might be behind you,” Both suggest the possibility of danger and the value of mindfulness. After the London Underground, our UK trip continued in an automobile through rural Wales. My husband navigated our rental car along the left-side of narrow winding roads, some single track, hemmed by six-foot hedges, no shoulders. In urgent staccato voices, we warned: Mind the sheep. Mind the hedge. Mind the oncoming car. 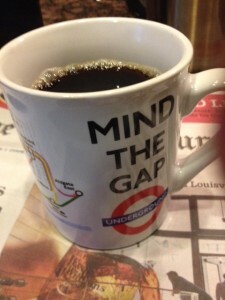 I cannot imagine a better vehicle for “Mind the Gap,” than a coffee cup. Morning is a hybrid of before and after—before the workday begins, and after the sleep. 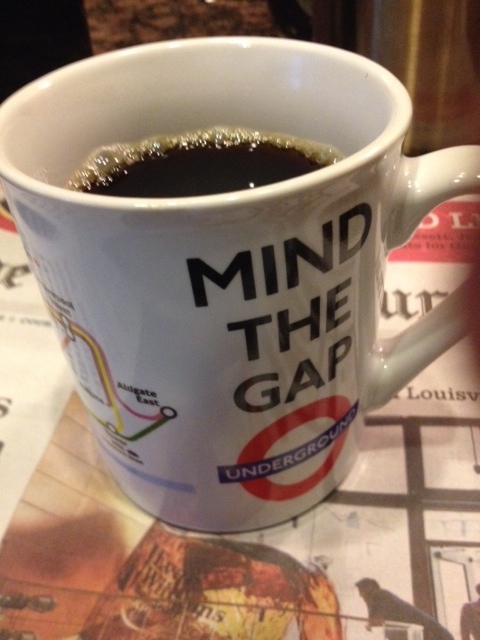 Each morning, I reach for my London Underground mug. It re-minds me to consider the gaps and transitions in my day and my life: between coffee and shower, between home and office, between the empty nest and retirement, between the here-and-now and forever-after. Notes on process: I began with pages of spontaneity: journal entries and incomplete thoughts that referred to twice-daily pub visits, beers named Courage and Brains, but no Heart, the surfers in wetsuits at the Gower, Dylan Thomas’ house, his hair, his favorite pubs (and there were many) and the pub in Fishguard where citizens gather to play the folk music “banned in 1870.” The music created one of those “moments” that we all wish for in life, where everything seems to makes sense (for a few minutes, at least). I wrote about my brother’s tendency to make friends with strangers and how I felt I was looking at our Dad while he stood there at the bar, making the bartenders in pubs guess where he is from (Welsh mistook his southern accent for Australian). All these disconnected events and observances would be meaningful only to myself and my fellow travelers.